What are you doing for World Sight Day? Thursday, 14th of October 2010 is the annual World Sight Day, held to increase awareness of the blind and partially sighted. 4% of the population have a vision impairment and 90% of blind people live in low income countries. 80% of blindness experienced is treatable or could have been avoided. Safelincs’ chosen charity, Mercy Ships, is a charity that runs a hospital ship that provides life changing operations to those in the poorest countries. Mercy Ships delivers eye tests, cataract operations and delivers training and education initiatives to help prevent blindness amongst. Safelincs organises fundraising events and raises funds through the company as well as donates fire safety goods. To mark this year’s World Sight Day we are looking at ways of improving our service to the visually impaired and blind. We would like to improve our website to make it easier for a visually impaired person to use it. Posted on October 13, 2010 Author SafelincsCategories News and UpdatesTags blindness, mercy ships, visually impaired, world sight dayLeave a comment on What are you doing for World Sight Day? 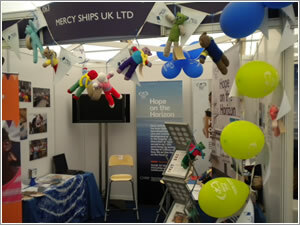 Mercy Ships, our official office charity, went to the Southampton Boat Show to raise their profile and to widen the knowledge about the valuable work that they do. The organisation runs a ship crewed by volunteer doctors, nurses, water engineers and agriculturalists. It visits some of the world’s poorest countries to offer free medical aid and to deliver projects to improve health care in partnership with local communities. 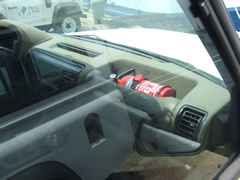 To take part in the show the Mercy Ships stand had to have a fire extinguisher fitted, making it compliant with the organisers’ health and safety policy. 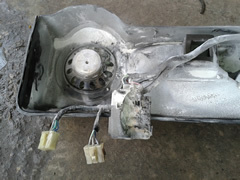 The extinguisher used at the show was donated by Safelincs. This is just a very small contribution, but it marks our continuous support to this organisation. Whilst at the show the general public were able to sponsor and name a knitted teddy bear, which would then be given to one of the children attending the ship for treatment. On Friday, months of preparation came to fruition as our Charity Auction for the benefit of Mercy Ships took place. We had some fantastic prizes to offer and we raised in excess of £1,700. This event would not have been possible without the generosity of all those who donated something to the auction; our youngest donor, Rosie Morris, was just 7 years old. The evening entertainment included a magician, Andy Mayfield, who donated his amazing talents to the event and a fantastic five piece jazz band, the Pris McGirr Quintet. We would also like to thank the Woodhall Spa Hotel who donated the hire of the room for the event. Their staff were very attentive throughout the evening. Finally, a huge thank-you must go to all those who attended the event and gave so generously. We have spent the last few months organising a charity auction for our company charity, Mercy Ships. The event will take place tomorrow night, May the 7th, at Woodhall Spa Hotel, Woodhall Spa at 7.30pm. We have had tremendous support from the local community with businesses and local residents supporting the auction with donations. Our auction lots include a jewellery making session, family photo shoot, ride in a Porsche 911 Carrera 4s, party package for 6 people pottery painting, a painting, a wooden carved bowl and much much more, in total over 30 lots. The event will also include a magician and a five piece jazz band playing to entertain after the auction has finished. Five members of the Safelincs team went to Saatchi & Saatchi Design in London for a Twitter training session last week. 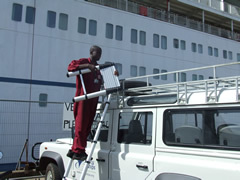 The training had been gained through a charity auction for Mercy Ships at their 2010 Ball. As we have only just started to use Twitter as a way of communicating through Social Media, this was an opportunity not to be missed. The training carried out by Ashleigh Goodall, the MD at Saatchi&Saatchi Design was invaluable. We covered a lot of ground about how to disperse interesting and relevant content through Twitter and how Twitter can be linked in with the overall communication with our customers.